Commander Doug Eckert was named the new leader of the NOPD Second District on Friday, returning for his second stint in the Uptown-based district after several years leading investigations for the entire city. Eckert’s transfer was one in a long chain of transfers and promotions announced by NOPD Superintendent Shaun Ferguson and Mayor LaToya Cantrell on Friday. The Eighth District also received a new commander, as did several of the department’s internal divisions, and Ferguson reshuffled his command staff following the departure of two high-ranking officers to Baltimore with former Chief Michael Harrison. Eckert had previously spent about six months in the Second District as the supervisor of investigations, second in command to the district’s commander at the time, Paul Noel. Eckert departed to lead the city’s crime lab and then its central Criminal Investigations Division, and Noel was later named a Deputy Superintendent to Harrison. Friday’s announcements did not specify a new assignment for previous Second District Commander Jennifer Dupree. Today, NOPD Superintendent Shaun Ferguson announced several leadership changes designed to implement his vision for continued progress. Friday was the last day for two individuals who played major roles in laying the foundation for the reforms in the NOPD are leaving the department to join Commissioner Harrison in Baltimore. Stepping into the Deputy Chief of Staff position will be Dante Bidwell, who will be promoted from Compliance Manager. Deputy Chief Paul Noel will receive his third star and be promoted to Chief Deputy Superintendent, solidifying his role as the second in command of the New Orleans Police Department. Noel has served as deputy chief over the Field Operations Bureau for the past three years. Before that, he was commander of the Second District. Danny Murphy’s position will be filled with a commissioned officer. Cmdr. Otha Sandifer will assume the role of DC of the now Professional Standards and Accountability Bureau. Commander Otha Sandifer is being promoted to the rank of Deputy Chief of Compliance. Sandifer, a 26-year NOPD veteran will be the first commissioned deputy superintendent of the compliance bureau. Sandifer was appointed Commander of the Compliance Bureau in 2016. Before coming to the compliance bureau, Sandifer was Commander of Academy from 2012 to 2013, Commander of First District from 2013 to 2015. Lt. Sandra Contreras will be promoted to the rank of commander, to assume the role being vacated by the Sandifer’s promotion. Contreras, a 19-year NOPD veteran, moves over from her position as second in commander in the Third District. Before moving to the Third District, she was assigned to the Eighth District where she was second watch platoon lieutenant, quality of life sergeant, and platoon sergeant. Regina Williams will be assuming command of the Criminal Investigations Division, moving over from the Public Integrity Bureau. Williams will be assuming the role held by Commander Doug Eckert, who is moving to the Second District, filling the top spot there. Eckert was Commander of the Criminal Investigations Division from 2015 until his appointment to the Second District. Prior to that, he ran the Crime Lab/Central Evidence and Property from 2014-2015. Eckert also ran the DIU in the Second and Fourth districts. Taking Williams’ place will be Special Victims Section Commander Sabrina Richardson, who is moving to PIB. Prior to running the SVS, Richardson, an almost 20-year veteran, was second in command at the Investigative Support Bureau. Before that, she was served in the Recruitment Division and in the Management Services Bureau. Commander Nicholas Gernon will be moving into the leadership role at the NOPD Crime Lab/Central Evidence and Property. Gernon is assuming that role as NOPD prepares to open its own lab, positioning the department to modernize its evidence analysis and maintenance operation, transforming it into a cutting edge facility. Before moving to the Eighth District, Gernon, a 17-year NOPD veteran, was assistant commander in the Sixth District, commander of the Homicide Unit, and a Homicide sergeant and detective. Lt. Octavio Baldassaro, recipient of medal of merit and medal of commendation, will move into the top spot in the Eighth District. 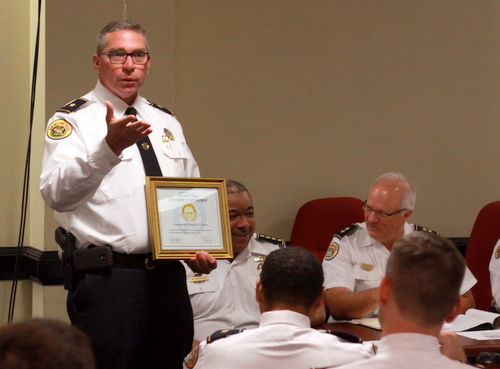 Baldassaro, a 21-year NOPD veteran, was most recently DIU Commander and second in command in the First District. He was promoted to the rank of lieutenant in 2015 and transferred back to the gang unit and major case narcotics, where a 2009 promotion to sergeant took him after seven years as a member of the SWAT team. Sheila Celious will be promoted to lieutenant, becoming the assistant commander of the Third District. Melvin Bush will be promoted to lieutenant, becoming the assistant commander of the First District. John Castelin, Lamont Walker, and Gina Cousin will all receive promotions to the rank of Sergeant.